At our program we have a very special room where our students get to discover and create using many different open ended materials – this space is our Atelier. 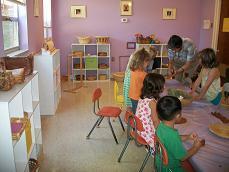 In this room students are given the opportunity to experiment with different materials in painting, drawing, creating collages, free form sculptures, group work, and many other activities. The teachers will introduce the activity and allow the students to use their own imagination in working with the materials. All of our students are given the opportunity to visit the Atelier on a daily basis. Our teachers take groups of 6 – 8 students at a time to work in our Atelier on individual and group work.